Take one capsule 1-2 times per day, with a meal. 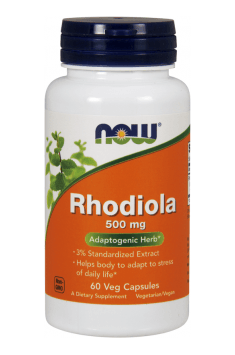 Rhodiola is an adaptogen, which increases physical and mental efficiency and reduces fatigue in situations of acute stress. We usually use the extract of Rhodiola - SHR-5 or its equivalent containing 3% Rosavins and 1% salidroside. The dose of 50 mg is sufficient for prophylactic use. Ad hoc use of Rhodiola in cases of fatigue and stress can be in doses of 288-680mg. Extract from Ginkgo biloba supplemented by the blend of herbs supporting the nervous system. Dietary supplement containing guarana extract. Supports concentration and stimulates the metabolism. The combination of PQQ and CoQ10. Support of the work of mitochondria, adds energy and vital powers. Kudzu root in capsules. Natural aid in overcoming an addiction, support for detoxification.